Kazakhstan's President Nursultan Nazarbayev arrives for the ASEM 12 in Brussels, Thursday, Oct. 18, 2018. At 78, Kazakh President Nursultan Nazarbayev is the region’s oldest leader. Naturally, speculation abounds about a successor. Who will run Kazakhstan after President Nursultan Nazarbayev, its current and only leader, passes from the political scene? Nazarbayev, who has held the presidency since the formation of the independent Kazakh state 27 years ago, is 78 years old. The question of who could take over as president after him has become a topic for discussion among regional watchers in recent years, as Nazarbayev occasionally disappears from the political scene to receive medical treatment abroad. Kazakhstan’s power structure, like many post-Soviet states, is pyramidic in nature. From his seat of power at the top, a series of patronage networks flows down the ranks of government, distributing money, favors, and power to those who have the right connections. If Nazarbayev were to suddenly be removed from the top seat, it is unclear what would happen next and who would take over. Transitions in countries with systems like Kazakhstan are complicated. Not only do they pose a threat to those tied to the top players, but they don’t necessarily follow the predictable rules and procedures of a democratic transition elsewhere. This opacity raises the specter of dramatic regime change, destabilizing confusion, and possibly violent power struggles; it also motivates those near the top of the current power pyramid to manage the process carefully to ensure their own survival. For that reason, it’s most likely that Nazarbayev’s political heir will be someone close to the current apex of the pyramid, with many of the same networks, who won’t be too keen on radical change. There are a few likely candidates who fit in that mold. Near the top of many analysts’ lists of possible Nazarbayev successors is Kassym-Jomart Tokayev, the current chairman of the Senate, second only in power to Nazarbayev himself. Tokayev would technically become president in the event that Nazarbayev dies in office, or is deemed unfit to rule. Given the careful way in which Nazarbayev has guided the country thus far, it is possible that he will try to orchestrate a more peaceful transition via elections. Should he opt not to, or die suddenly, however, Tokayev would be the next in line for the presidency, at least in the interim. Tokayev himself, apart from prime positioning within the Kazakh government, isn’t an unqualified leader. He started serving on Nazarbayev’s cabinet in 1992, and has an impressive resume of government service both domestically and abroad. However, where Tokayev may fall short is domestic policymaking. He lacks experience in implementing Kazakh domestic policy initiatives and that may call his long-term leadership potential into question. Moreover, he is a man of Nazarbayev’s generation. At 65, Tokayev does not offer much hope of a long presidency. Another potential successor is Karim Massimov, a former two-term prime minister, and now chair of the all-powerful National Security Committee. Massimov has a proven track record of loyalty to the Nazarbayev family and extensive knowledge in some of the areas considered most important to Kazakhstan’s future development. In his time as minister of the economy and budget planning, he successfully helped Nazarbayev sail through the tumult of the 2008 financial crisis, and even grow the economy in the years that immediately followed. Moreover, he is widely considered to be something of a China expert, with connections to the Kremlin as well — two very important relationships that Kazakhstan has been working to deftly balance in recent years. That being said, there are a few disqualifying factors that could limit Massimov’s rise. As Kazakhstan works to define both its national and ethnic identity, it is unlikely that anyone who is not ethnically Kazakh could take the presidency. Massimov, a Uyghur, is a Kazakhstani citizen, but not Kazakh — an important distinction that matters to many Kazakhs, as they seek to define Kazakhstan as a nation-state. Scholars from both inside and outside the region have emphasized the importance of building ideology at the highest levels and using that as a tool to define the future. Would the development and implementation of this ideology at such a level be left to anyone who was not Kazakh? Unlikely. While Kazakhstan has sought to define itself as an overwhelmingly open, diverse, and welcoming state — and generally succeeded in this effort — it is unlikely that the same would apply to the highest office in the land. Next on the list of individuals to consider is Imangali Tasmagambetov, the current Kazakh ambassador to the Russian Federation. He absolutely has the credentials to become the president of Kazakhstan, and for that reason, will likely be unable to. Starting in 2002, he served Nazarbayev in a number of positions — as prime minister, mayor of both Almaty and Astana, minister of defense, and just before his appointment as ambassador, the deputy prime minister. Clearly close to the Nazarbayev family, Tasmagambetov has always played an important role in the government. 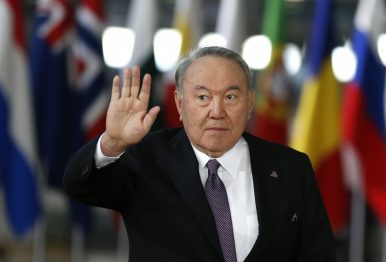 However, his sudden appointment as ambassador to Russia in 2016 has led to suspicions that Nazarbayev feels threatened by his long-term ally, and moved to place him where he couldn’t garner enough support to run for president and would be constitutionally prohibited from doing so — the president must have spent the last 15 years living in Kazakhstan. Another often-mentioned successor is Dariga Nazarbayeva. Nazarbayev’s first daughter likely has only a slight chance of inheriting the presidency from her father for a few reasons. First, all of the political experience she has gleaned thus far from her stints in parliament has positioned her instead to become prime minister, take up a cabinet position, or another deputy prime ministership. She’s been strategically positioning herself within the Majilis, taking on more and more important roles, including an attempt to become the speaker of the Senate (number two in line to the presidency), but was denied, perhaps signalling that she would not be an ideal successor. Second, unfortunately, is her gender. While Roza Otunbayeva successfully held the interim presidency in neighboring Kyrgyzstan, it is unlikely that Nazarbayev’s daughter could do the same, in spite of her father’s tacit support. Otunbayeva is in many ways the exception to the prevailing view in Central Asia that women have no place in national politics. Nazarbayeva will have a field of opposition and few allies to support her should she decide to make an official play for the presidency. Another Nazarbayev relative often floated as a presidential possibility is Timur Kulibayev, a Russian-educated economist married to Nazarbayev’s second daughter, Dinara. Together they have majority holdings in Halyk Bank, and have a net worth of $3.8 billion. Throughout his career, Kulibayev has served on the boards of some of Kazakhstan’s largest and most important energy production and transportation firms. He’s also been very publicly involved in promoting Kazakhstan’s place in international sports as president of the Kazakhstan Boxing Federation and president of the National Olympic Committee. Given that much of Nazarbayev’s time in office has been spent building and rounding out initiatives in the infrastructure and energy sectors, Kulibayev is uniquely well-positioned to continue this work based on his education and experience. Moreover, he’s unlikely to turn on the Nazarbayev family. Like many countries in the world, regime change in Central Asia tends to end with the former top elite largely disenfranchised if not dead — while it seems unlikely that the Nazarbayev family would face destruction, they’d almost certainly have to take the possibility of personal disenfranchisement into account. The only downside to Kulibayev is his messy personal life. He has been involved with Goga Ashkenazi, a wealthy Kazakh businesswoman and socialite, who has given him two sons. Ashkenazi was educated in the West and has spent most of her professional time in London and Milan, developing a fashion line. While in the West such an affair would likely cause a political uproar, in Kazakhstan after the collapse of the Soviet Union some of the elite returned to the practice of having tokal (junior wife), such that this could be dismissed. However, there is the additional issue of the 2011 Zhanaozen Massacre, where 14 Kazakh oil workers were killed during protests for better working conditions. Kulibayev, at the time chairman of the joint-stock company Samruk-Kyzna, was forced to resign as part of the Nazarbayev family’s response to the tragedy. Kulibayev stated in 2011 and again in 2012 that he saw politics and business as separate — if asked to take the presidency, perhaps he might find himself thinking a bit differently. Much speculation about power transition in Kazakhstan assumes that Nazarbayev leaves the political scene suddenly, in the event of his death, or sudden illness. It is possible, and possibly even preferable, for there to be a managed transition of power, perhaps as soon as 2020. Prior to the 2020 presidential elections, Nur Otan — Nazarbayev’s party — could nominate a hand-selected successor, and ensure his (and it probably will be be a “his”) election to the presidency. Tokayev himself mentioned such a scenario earlier this year in an interview with the BBC, stating that it was unlikely that Nazarbayev would seek re-election in 2020. If this happens, it would be all the more likely that Kulibayev would be the one to take power — he is a part of the same political structure, rather than an outsider, and with his enormous wealth and connections both regionally and to the West, he is in the best position to continue distributing patronage without completely turning over the current networks and threatening the integrity of the Kazakh state. Moreover, Kulibayev would still be susceptible to Nazarbayev’s influence as his father-in-law and patriarch of the family, as well as the former president of Kazakhstan. Natalie Hall graduated from the Elliott School of International Affairs in 2017, with a degree in International Affairs (concentration in security policy) and minors in History and Slavic studies. She lived abroad in Kazakhstan for six months, and travels back to the region frequently. Kazakh President Nursultan Nazarbayev ResignsNazarbayev Won't Be Kazakhstan's Next President...Or Will He?Restructuring of Kazakhstan's Banking Sector ContinuesWatch the Throne: Trans-Caspian Pipeline Meets Succession Politics in KazakhstanWhy Is the Kazakh President's 'Cold' Making News?